Paul’s Blog has been updated! Everyone is strongly advised to click the link below and catch up with what Twisted Studio’s resident artist and magician is up to. A NEW BLOG HAS ARRIVED! Click here to check out what’s new with our resident magician/artist. Twisted Features # 15 – Part 2 – The Return of “The Underground” and The Underground shorts! When I started working for Twisted Studio, I wanted to get a feel for the characters and flex my muscles as a writer while showing Paul that I can research and produce something new while keeping it within the world he had been so careful to create and nurture for years. The result of that effort came in the form of the great new nemesis for Styx and gang, the “Termite Union” and a new form to get our stories out. Thus the Twisted Short Stories were born with the first of it’s kind, “A Tragic Loss” – see below. Before long another short was conceived and a new focus was taken. I decided that instead of a direct companion series to the comics I would write them as a prequel series to prep new fans and open the way for future inclusion of the Termites. This new series would tell the background story of The Underground from the point of view of Raymus. The first of which is entitled “Tempest and Harmony” – synopsis is also below this feature. This series will continue next year with “The Orphan” which will continue Raymus’ search for identity in The Underground and of course will see new Termite characters introduced. Also coming in 2016 is the sequel to the Tecumseh shorts mentioned in the last feature. Stay Tuned! Stoic as always, Styx and his new steed face off against the Termite Union in the first Twisted Studio Short story EVER! The Termites are like no enemy ever faced before but don’t count out The Hive. Always plotting behind the scenes against the Ants of Coryn, they are sure to get involved if they can. Styx defies all who stand against him but will his guile and fighting ability be enough? Email us today to get your copies for only $3 each or both for $5. Twisted Features # 15 – The War of 1812 and Tecumseh Shorts! Growing up in Windsor, Ontario; Forever living under the oppressive shadow of the once mighty city of Detroit, I have always been intrigued by the wealth of amazing history beneath my feet. I was drawn back in time to my first fishing trip ever as a child with my brother-in-law to this tiny river almost a stream really, to a place named River Canard. The historical plaque there, hidden almost under the bridge forever impressed itself in my memory. This series of short stories will supplement the main story of Tecumseh’s rise and fall in our comic book series. So far two have been completed with synopses to follow. A third is being penned currently about the Battle of Queenston Heights which was announced on October 13, 2015 with the title of “The Death of our Heroes” to celebrate the 203rd anniversary of that great battle. Who is the Red Haired Man? Follow our heroes both real and fictional from Essex County and elsewhere in Ontario, meet the invaders head on and strike a blow they cannot easily shake off. Their journey takes them from the quarters of Colonel Matthew Elliott at Sandwich, down the Detroit River to Fort Amherstburg then across it into the endless forests of the Michigan interior. How can an unassuming bridge in the middle of nowhere cause so much fuss? In 1812, it was the only way for the Americans to continue their conquest from occupied Sandwich. Besides the bridge was guarded visibly by two guards, redcoats Hancock and Dean. Secretly, Tecumseh and his British allies have a trap planned. Can they save Fort Amherstburg and the town of the same name from the same fate as Sandwich? Posted on 13th July 2015 in What Are You Reading? Paul Reaume walks us through his thoughts on Marvel’s new title roster. “I popped into Paper Heroes Comic Lounge this week to put a dent into my stack of Batman comics. The store owner, Scott, threw a copy of Marvel’s Preview book into my bag, and I knew it would make for an interesting gander…maybe an interesting alternative to our usual ‘What Are You Reading’ articles. All in all, I have mixed feelings about the All-New, All-Different line-up. On the downside of the whole thing, I’m not a huge fan of having so many variants of the same title. The biggest example being the number of Spider-titles. Don’t get me wrong, I love Spidey as much as the next guy…but…we’ve got five “Spider” titles in this “new” and “different” line-up. That’s not including Webwarriors, Silk, or the two team titles boasting our friendly neighbourhood web-head. I think that’s my concern with the new line-up in general; the amount of character overlap between titles. I even saw Venom on three different previews. I guess I was just hoping for a little more variety in an All-New, All-Different roster. On the plus side, however, I’m intrigued by some of the bold moves Marvel did make. The amount of female headliners is really promising. An all female A-force? A female Star-Lord? Thor? I think it’s awesome. I’m also excited to see the now villainous Uncanny X-Men led by Magneto himself. In fact, that may be the title that I am most excited about. If nothing else, Marvel’s certainly shaken things up, and stirred up some hype. Will this new line-up stand up to the success of Marvel’s previous rosters? Time will tell. It looks like there is a little something for everyone, even Howard the Duck. Who doesn’t love Howard after all? Those are just my thoughts though. 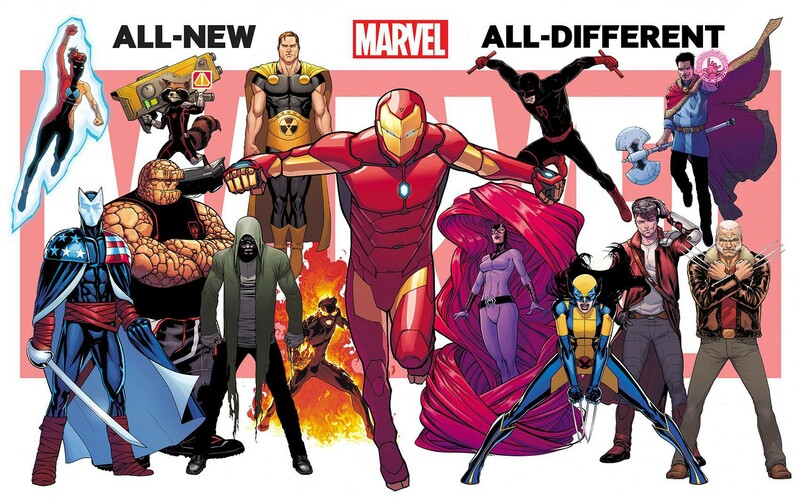 You can learn more about Marvel’s New and Different lineup here. After you’ve done so, why not share your thoughts with us? What do you think of the previews? What titles are you most excited for? It was approximately eighteen years ago when local artist Paul Reaume came up with the idea for The Underground. In the years since that first moment of inspiration, the series has seen it’s fair share of research and creative development. With the intention that the series would include as many real-world facts as possible, countless hours have been spent researching. Piles of notes, and sketches have littered Paul’s home. Sleep has been sacrificed more times than he can recall, and meal times have been shared with drawing time. Because Paul and his creative team believe so deeply in the potential of the bug infested comic book that they have committed themselves to its proper development. It is this belief that has driven Paul to compile years of source materials, images and literature in order to create such an expansive universe literally within his backyard. Now as his team is nearing completion of The Underground’s third installment, all of that research is about to take center stage. The Underground site is undergoing a bit of a facelift. The team plans to restructure it in such a way that it better reflects “The Archives”; a massive binder bursting at the seams with information gathered for The Underground. Every bug, every character, every weapon or location that the creative team has come up with over the years will be here. And its going to be awesome. Such a task will take time to execute properly, of course. Much of the work is expected to be completed throughout July. After that, there will be no shortage of material to update with. Paul and his team are making a statement it seems. The Underground is here. And it’s not going anywhere. Click on The Underground banner on the left to check out the project’s site in its entirety. D AVE: So Paul, how did you first get in to performing magic? PAUL: Well I’ve grown up around magic, really. My dad and uncle are magicians. I had my stage debut probably around the age of five when I walked out to bow for the audience before one of their shows on Bob-Lo Island. Fast forward; I’m all grown up, but something’s haven’t changed. DAVE: How long have you been performing now? PAUL: I’ve been performing real ‘gigs’ for a couple years now. I’ve done birthday parties, picnics, stage shows, and corporate events. Before that I was practicing magic for my own personal amusement. DAVE: What’s the name of your show? PAUL: My general show is called “The Fantastical Feats of Paul Reaume”. But I do a number of themed shows as well. These give me the opportunity to develop fun new characters, and add a new twist to some old favourite tricks of mine. I’ve been a pirate, a leprechaun, and a transdimensional, time-travelling doctor of sorts. DAVE: Sounds like you could have an identity complex! Is any one of these characters your favourite? PAUL: The Peculiar Pirate Paul has always been my favourite. I dig pirates, and Pirate Paul was the first themed show I developed. I actually give the character a lot of the credit for helping me build my confidence as a performer. DAVE: I’m sure many of us have seen a magic show of some sort. What makes yours different? PAUL: Well there’s certainly some overlap that will happen when it comes to specific tricks that I and other magicians perform. I try to really connect with my audience. I put the magic in their hands whenever I can. My shows and performances are always fun and engaging. I often tell my audience that if everything works out perfectly we’ll have a fun magic show. If it doesn’t work out, at least we’ll have a comedy act! It’s all about creating a memorable experience, I think I’ve succeeded at that. DAVE: It sounds like something you are very passionate about. Can you share with us a story about your magic experiences? PAUL: Absolutely. 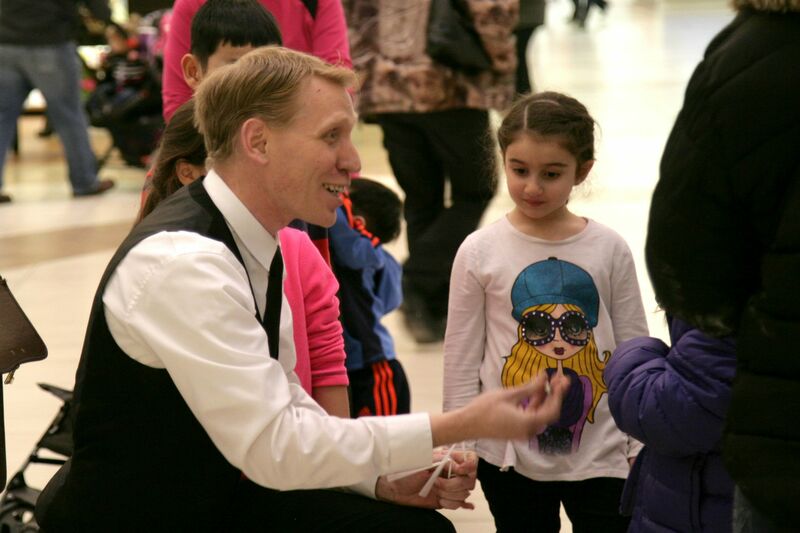 I was finishing up a performance at Devonshire Mall when a young boy approached me and said “Your show was too quick”. Apparently he had shown up late, and missed the majority of the show. I stopped what I was doing and kneeled down beside him. I told him that we were going to do some magic, just the two of us. I performed a coin trick that actually left him with a little souvenier to bring home. People who had seen the show and then saw this little mini performance told me afterwards that the coolest thing they had seen was the time taken in giving this young boy his own magical moment. DAVE: Well I think that about covers it, Paul. Do you have any shows coming up? PAUL: The next date that I can think of is some Friday Night Fun at Devonshire Mall. I’ll be there August 14th between 5 & 8 doing some up-close acts and some strolling magic. It’s one of my favourite ways to meet and interact with people. There you have it Twisted Fans. Paul Reaume; Twisted Studio founder, resident artist and wise-crackin’ magician. Check him out at Devonshire Mall August 14th, and stay tuned with us here at TwistedStudio.ca for more updates and insights. Another Free Comic Book Day has come to pass. While we’re always a little saddened to see our favourite day of the year come to a close, we had a really great time celebrating and meeting some new friends. This was a particularly important Free Comic Book Day for Twisted Studio as we are coming off of a relatively dormant year. While we have not been inactive in our Twisted duties, we’ve definitely been working more behind the scenes. This year’s Free Comic Book Day event was a great opportunity to share with our followers what we’ve been up to and what our plans are. 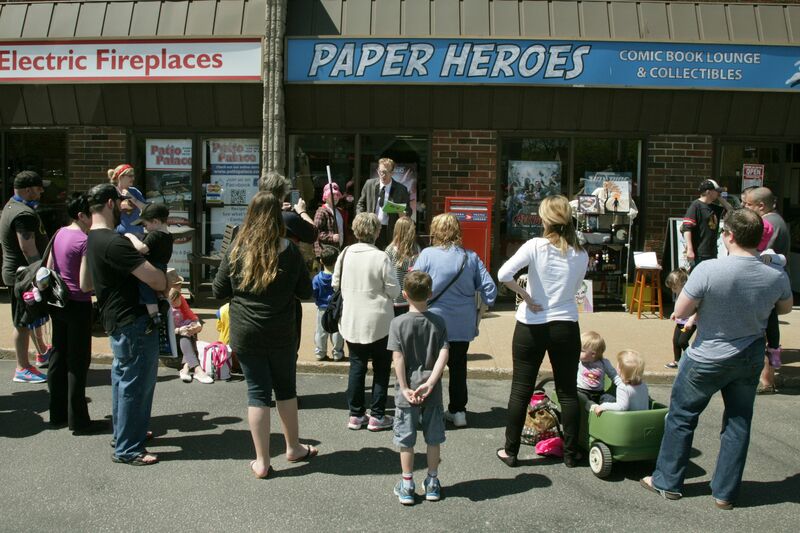 As we did last year, we participated in the FCBD festivities at Paper Heroes. Shop owner Scott St. Amour hosted another tremendous event, and we couldn’t have been happier being a part of it. We had the esteemed privilege of sitting alongside some very talented Windsorites. Horror author Christian Laforet introduced us to his book “The Space Between Houses”, and we were dazzled by the work of the artist known as ‘Phil’. It’s always great to meet and speak with local talents, to share in their creativity and share in our mutual experiences. Twisted Studio projects The Underground, and Tecumseh were represented at the event with issues of The Underground being sold, and preview art for Tecumseh being displayed. While the last year has not yielded any impressive amount of progress on these projects, we’ve spent much of our time solidifying some alternate sources of revenue. Producing a small run comic series is a time consuming and expensive endeavour, while we have been running a preorder incentive program other options were necessary. To that end we have looked at developing a few games as a subsidiary division to our main projects. Additionally, Twisted Studio artist Paul Reaume has been moonlighting as a magician! Which brings us to our next point about Free Comic Book Day; the debut performance of the cosmic conjurer…the time travelling trickster…the one and only, Dr What! Just one of Paul’s magical alter egos, the amazing Dr What brought a mystifying performance of comic proportions. This particular show was tailored to suit Free Comic Book day specifically, but Paul has seen great success with his other illusionist identities as well. Characters such as “The Peculiar Pirate Paul”, and “The Lucky Leprechaun” have dazzled audiences around Windsor over the last year and a half. Free Comic Book Day’s performance was a welcomed marriage of Paul’s two passions; Comics and Magic. As you can tell, May 2nd 2015 was filled with fun and excitement. While we’re always happy to hear from our fans and followers, the greatest thing to hear this year was how anxious they are for MORE! More bugs, more Tecumseh, more Twisted Studio. Well thank you to our loyal Twisted Fans. We hear you loud and clear, and we don’t plan on disappointing! 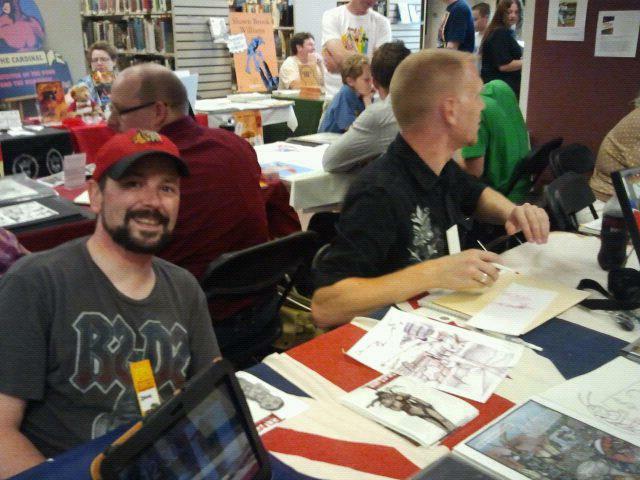 Three years ago Dave and I decided to attend our first comic convention as a studio. In hopes of raising awareness of our projects, increasing circulation of our printed books, and learning more about our craft we set our eyes upon a ‘small’ event in Ann Arbor, Michigan. I use the word ‘small’ loosely here, as the event would prove to be anything but. The Kids Read Comics Event had arrived in Ann Arbor (the previous year it was held in Chelsea, MI), and it seemed like the surrounding community had banded together to make it a success. While the main event took over the Ann Arbor District Library; several associated activities, classes and lectures were hosted throughout the surrounding area. Whether you were sitting in a cafe enjoying a book talk, on campus discussing the use of comics as educational tools, or in a comic shop participating in a drawing class; the theme was the same. Engaging kids and teens in a way that will ignite their own creative thinking, and foster a new thirst for learning. We’ve learned so much ourselves in our three years of attendance at the KRC. We’ve met some extraordinary people, and received some valuable advice. We’ve sat shoulder to shoulder with established creators, and fresh talent. I learn something new every year, and it keeps me coming back for more. The KRC 2014 has concluded, and this year was no different than the rest…actually it WAS different. This year we brought my son Ayden along with us. I was so proud of him; to see him engaging with peers, and speaking with professionals. Equally so, I was impressed again with the event as a whole. I watched as something ignited within my son this year. I saw his passion flare, and his inspiration soar. It’s all I hear about now; his very own book that he’ll be bringing to the KRC next year. 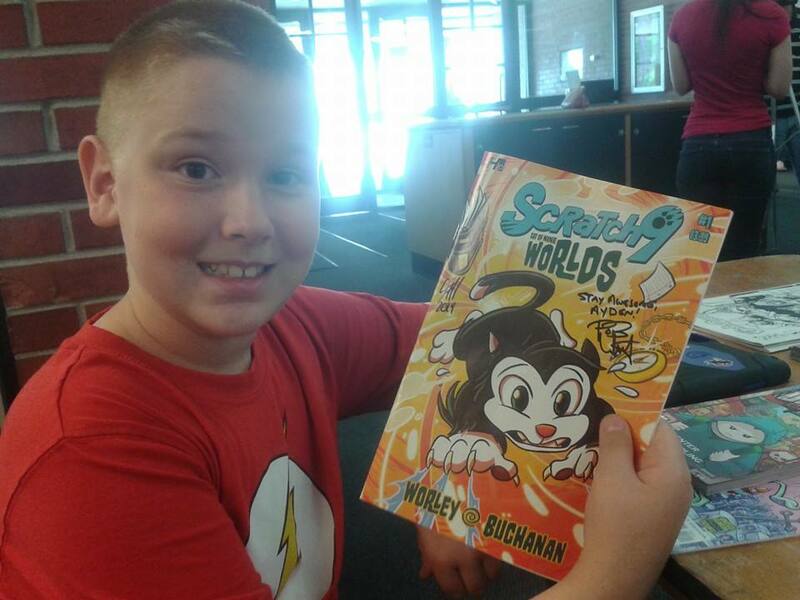 Thank you KRC for nurturing life-long learning, and encouraging a new generation of comic book fans.